If you’ve sold at a craft show before, you’ve probably noticed those “IT” booths. They got it goin’ on. They scream, “cool” without having to say a word and have a steady stream of shoppers in their space all day. The handmade products they sell have their own vibe, their display is on-point and the vendor looks relaxed and confident. You’ve likely also noticed that it’s not one category of product that’s consistently the most popular. What sells best at a craft show has less to do with what’s being sold and more to do with how it’s being sold. Which is why the article teaches you how to turn any product into a bestseller at a craft show. Anyone can have the best selling product of the day, regardless of the category they’re selling in. I’m an observer and whenever I been at a craft show, either vending or shopping, I pay close attention to ALL vendors. I’ve seen everything from rice heating bags and cozy crocheted scarfs to food shaped jewelry and quirky cards draw a constant crowd. Besides, you’re not really looking to change what you make are you? I’d bet you’re just looking to sell more. 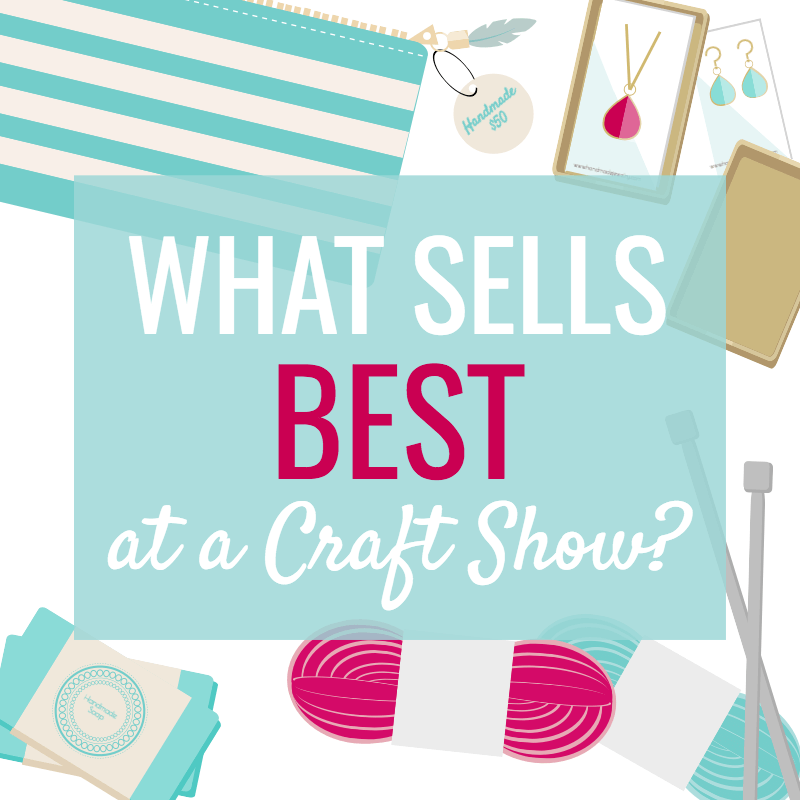 Keep reading to find out how…..
WHAT MAKES A TOP SELLER AT A CRAFT SHOW? They’re not displaying 50 different products in 20 variations, just in case someone isn’t a fan of their first version. They’re proudly showing off their style, even if it’s different, quirky or edgy and aren’t worried about it not being a fit for everyone. They’re not confused when it comes to their brand. They’ve built a craft show display based on what works for them, their business and their customers. Their brand’s personality and style are splashed across every element of their space. From their signage and photos to their tablecloth and display fixtures. They’re not hiding behind their craft show table, using pushy tactics to move product or looking desperate for a sale. They’re authentic and have a way of talking about their handmade products that garners interest and makes shoppers feel comfortable enough to stick around and ask questions. They know the identity of their business and they’re confident in their direction. If that’s not you already, it easily can be. Check out what makes the most popular products, displays and people at a craft show. For a start to finish guide and worksheets to walking you through creating a craft show display that draws shoppers over and helps you make sales, join this FREE 5 DAY CHALLENGE. It will give you clear instructions through email, worksheets to help guide you through the steps and leave you with a plan. Craft show vendors have shared some of their epiphanies with me as they work through the challenge as well as feedback on how much they’ve enjoyed it. I think you’ll enjoy it too and the best part is; it’s FREE! Read a bit more about the challenge here or join for free below. Your handmade products are obviously the start of your craft show booth or table. They’re what your signage, figures, props, etc. revolve around. If you don’t have your products right, the rest of your display won’t matter. It’s not necessarily about selling a “popular” product. Jewelry, soap and crocheted items are often prominent at a craft show but just because someone sells under one of those categories doesn’t mean they’ll sell out. It’s about selling a unique product. Once you have that down, you can broaden your selection (just a little bit!) to include more price points and increase your sales. ARE YOU MAKING TOO MUCH? One of the most common mistakes I see craft show vendors make is trying to offer too much. I totally get it. I started doing craft shows years ago and have sold everything from pajamas and aprons to a wide selection of purses. We’re creative people and we want to show off and nurture that creativity by trying a hundred different things. But I know from experience, as fun as it may be to go crazy with product selection, your sales can majorly benefit when you reel it in. You can still get creative with a limited product line. That creativity just becomes more focused. It’s like coloring; when you were young, you scribbled inside, outside and all over that line. But as your skills improved, you began to color mostly inside the line. As they improved even more, you began playing around with more advanced techniques like shading and creating your own lines within the line. And if you keep growing your coloring skills, you eventually don’t need the lines to guide you. Some of the more successful craft show booths I’ve come across sell one product and one product only. So don’t be fooled into thinking smaller selection means fewer sales. But that’s definitely not to say you can’t be successful selling several products. They just need to all have a similar message. We’ll cover how too many products affects shoppers in the next point. First let’s look at how it affects you. Your products become less profitable. Each time you need to switch tools, patterns, materials, etc. you lose time and become less productive. When you’re focusing on one product you can pump them out much quicker and more efficiently, which means more profit for you! It’s harder to create an effective craft show display. You don’t have a lot of room at craft shows. When you have too many products that are all different, you have to find a way to fit them all on your craft show table. Narrowing down your selection allows you to have more fun with your display and communicate a message as opposed to worrying about how you’re going to fit everything in. You’re competing with more vendors. When you make an item like soap, you’re competing with every soap vendor for sales. If you get specific and narrow your products down to soap for dry skin, you’re competing with fewer businesses…especially in the handmade world. When people need soap for dry skin, they’re coming to you, not the guy who makes not-sure-what-type-of-skin-it’s-for soap. You don’t have time to focus on other areas of business. There’s a lot more to a successful business than making product. Your branding, marketing, sales channels, connections, customers, etc. need your attention too. Instead of spending your time learning a new technique, drafting a new pattern or perfecting another new product, you can spend it nurturing other areas or your business. WHY SHOULD CRAFT SHOW SHOPPERS BUY FROM YOU? Chances are, you won’t be the only one selling under your category at a craft show. Even if you have a unique product at an event, shoppers will likely be able to find it online or have maybe seen something similar at another craft show. Which means your handmade products need to catch shoppers’ attention and immediately let them know why they should buy from you instead of the person down the aisle or the business they follow on Facebook. As mentioned in the last point, it’s okay to sell several products, but they should all have a similar message. Things get a little complicated when you start offering a wide variety of products appealing to a wide variety of customers. For example, if someone selling handmade bath & body products offers: soap, face wash, eye-cream, moisturizer, face masks, body scrubs, bubble bath, shower gel, hand cream and foot cream, they could still have a clear message…..if those products share a theme. Maybe they’re all for someone with dry skin. Or centered around a scent and targeted towards people who love florals, like lavender. Maybe the ingredients are the main focus and each one incorporates goats milk. Or perhaps they all use the same technique when being made, such as being cold processed. If I walk past a booth and notice a bunch of products for dry skin, I’m stopping dead in my tracks and heading over. This vendor is obviously an expert at what they do, understands my problems and has solutions to offer. Unless they have years of experience under their belt and proof to back up their expertise, call me skeptical. Although their reason for offering so many handmade products may be to appeal to more craft show shoppers and sell more product, they may actual start to miss out on sales. I may not even notice they have products for dry skin because they get lost among the selection. The space may even look a little cluttered and overwhelming and start to cheapen the value I put on their handmade products. I start to question the vendor’s authenticity; how can they possibly know how to deal with all those skin conditions? Do they really understand my type of skin? If they haven’t perfected each formula and I get that face wash home and it doesn’t help my dry skin, I’m not going back to purchase more. I may have a hard time purchasing more than one product because their selection of products for dry skin is minimized in order to fit all the other types of products on the table. Can shoppers easily describe your handmade products to another person? People take in a lot of different vendors at a craft show so it’s unlikely they’ll remember your business name. If they had to describe your business to the event organizer or a friend they wanted to visit your booth; what would they say? The one selling the _____________________. If they can only fill that blank in with is one word (e.g. jewelry, scarves, soap) because there isn’t ONE defining feature among all your products, you don’t have a clear message. What kind of jewelry, scarves or soap are you selling? The colorful statement jewelry, the chunky knitted scarves in soft colors, the skin care products for dry skin, etc. are examples of a defining feature. The more descriptive and focused you can get, the better. Once a main message is chosen, it makes it much easier to start building collections that appeal to the other needs customers have. For example, once a vendor has decided on skin care products for dry skin, they can address the different issues or needs someone with dry skin might have; washing their face, moisturizing, exfoliating, etc. These become clear product collections for the vendor. Collections are going to help strengthen your message, create an impactful craft show display and make it easy for people to shop. DO YOUR PRICES ENCOURAGE MORE SALES? Once you’ve drawn shoppers over to your craft show table or booth, the other important aspect to making sales is giving shoppers an entry point to become new customers. Lower the risk and the level of contemplation needed. How long do you take to think about a purchase when the item is $5 versus $100? The more money an item costs, the more contemplation it requires. Preventing shoppers from heading to the next craft show vendor because they can’t find something they can afford. Giving people an easy and low-risk option to test out your products. Adding the option for shoppers to buy that day, rather than buying nothing because they want to go home and think about it. Allowing shoppers to spend more; if they can afford the more expensive option, they’ll likely spend the extra money. If you don’t have the more expensive option, they can’t give you more money. Increasing perceived value; lower price points can show shoppers how much more they get for a small increase in price. Most of the shoppers you encounter at the event will be hearing about your business for the first time. You can’t expect to jump right into a full-blown, trusting relationship with them…you have to ease into that. Think about when you meet a person for the first time. You like them and would like to get to know them better. Are more comfortable giving them your number or committing to a weekend getaway? Unless you really hit it off, giving your number is a comfortable next step for most. Think of craft fairs and the shoppers in the same way. Most people won’t be ready to jump into a big commitment. Don’t aim to unload your most expensive items on the majority of shoppers that visit your space. Instead, use it as a way to introduce your brand and products to new people. If you’re vending at a craft show that targets your exact market, competition is low in your category, you’ve invited your existing customers and your higher-end product is a top-seller, you may decide to stock up on your more expensive items. But most situations will require you to stock up on lower-priced goods, offer a good selection of mid-priced goods and have a smaller selection of higher-priced goods. When adding on price ranges, you don’t have to reinvent the wheel or invest a ton of time/money into new handmade products. I have some super simple ways to offer more price options and increase sales; I’ll share at the end of this article. A strong craft show display is essential. If it doesn’t attract shoppers, it doesn’t matter what you have on that table, you can’t bring in your top sales. People see your display from a distance and it’s their first impression of your business. If they can’t see anything because your products are laying flat or they see you but your display gives off the wrong vibe, they may not bother stopping at your craft show table. It’s not about being over the top or flashy. It’s about creating a cohesive look your ideal customer will be drawn to as soon as they walk in the venue. Make it easy for people to shop: products are set up to create a flow of traffic (even if the space is a 6ft table), display fixtures encourage people to pick items up, low-end price range items are near the “cash desk”, etc. BONUS: Encourage purchases after the craft fair. Consider using this trick to save on printing costs and keep your business cards out of the trash. And this technique to put the ball in your court. I’ll have more information at the end of this article on how to implement each of these points but they all require a strong brand. So let’s start there. ARE YOU JUST ANOTHER CRAFT SHOW VENDOR? Or are you THE vendor? The difference between being another jewelry, scarf or soap vendor at a craft show and being THE jewelry, scarf or soap vendor, is branding. Non-existent branding makes your business less memorable. Bad branding can make shoppers remember your business for the wrong reasons. And good or great branding will help shoppers remember your business and encourage more sales. Imagine being served an amazing meal in a horrible restaurant. Sure the food is good but if the restaurant is dirty, the server is rude and the atmosphere is uncomfortable, it kind of ruins the whole experience. No matter how good that food is, you’re not likely to go back, tell friends to check it out or remember it next time you’re thinking about great places to eat. Branding tells shoppers who you are, if you’re a fit for them and why they should buy from you. If your branding doesn’t appeal to your ideal customer, you may be missing out on sales at the event and many more sales that could be coming in after. You need a clear definition of your brand before you start designing your craft show display. It’s an extension of your message, so keep your message in mind as you start defining your brand and the ways you’ll communicate it. Imagine the soap vendor again. Let’s say they’ve nailed their message (bath & body products for dry skin), collections and price points. Their products appeal to me, their ideal customer. But, I may miss their space entirely, decide to skip it or stop in but leave without purchasing, if their branding is off. I’m going to be looking for tables that have a look I’m attracted to. I’m going to connect with a business if they put value on the same things I value and share certain interests. And I’m going to listen to and buy from a business owner who’s speaking my language when it comes to #dryskinproblems. These elements may not seem that important when you have a great product but it’s just like that restaurant. If most of the elements are good: the food, the atmosphere, the location, etc. but the server is rude, it makes you question how great the business and food actually are and if you’re willing to spend your money there again. Start with your message and determine how you can carry it throughout your brand. Once you’re clear on your brand, make sure it comes through in your craft show display. It should appear in everything from your signage and price tags to your tablecloth and display props. You should also be representing your brand. Which brings us to the next point…..
Last but not least, the person standing behind the table has a huge impact on sales at a craft show. Getting to meet the vendors is one of the big reasons people shop at a craft show. Let them see the interesting person behind the handmade products. Remember that Seinfeld episode where Jerry finds out the guy who runs the tennis shop, Milos, can’t even hit a tennis ball? Jerry was once willing to spend $200 on a tennis racket because Milos recommended it, and he’s a pro. But once he finds out Milos can’t even play, Jerry feels duped and is unwilling to shop at his store anymore. If your products say trendsetter but you, the vendor, don’t dress or speak in a way that also says trendsetter, shoppers will begin to question your business’ and products’ authenticity. You also want to be sure you’re sharing information your ideal customer will care about and finding an authentic way to sell. Using the wrong terms or not talking at all won’t help your sales. You are a part of the brand and you want to ensure you dress the part on craft show day. I know you’re likely tired and have stayed up half the night getting ready for this day but don’t let that stop you from putting effort into the way you look. You know the saying: birds of a feather flock together so if you can put together a look that would be similar to one your ideal customer would select, you’ll have an even easier time attracting them. You’ll also strengthen your message. Think about the way you speak too. If your brand has a professional style, make sure you’re not using lots of “umms”, “likes” or slang. “That would totes look good on you!” might evoke an eye-roll from the sophisticated clientele you’re trying to attract. If your brand is a little more relaxed, you may want to talk to customers as though they’re your friends and you’re sharing advice on ____________ (jewelry, fashion, skin care, etc). Have you ever been around a sales person who makes you feel uncomfortable? What does it make you feel like doing? Sticking around and chatting or getting out of there as quickly as possible? So many craft show vendors are worried about coming off as a pushy sales person that they figure it’s better to leave the shopper be than start a conversation. I worked in retail for years and the sales associates with the (consistently) best sales numbers weren’t selling geniuses. They simply followed a formula with each shopper and left the pushy tactics at home. Listen, very few people actually enjoy selling. But if you simply allow people to shop your booth and don’t speak up, you truly are leaving money on the craft show table. People shop at craft shows because they want to find unique items made by unique people. They want to be able to boast about the cool handmade products they bought and the interesting stories behind them. You’re actually taking away from their shopping experience if you quietly sit behind the table and don’t explain your handmade products. We all want to have interesting things to talk about. Let your products be the topic of conversation and give your customers something to share once they leave your craft show table. It will also turn them into your personal promoter among their friends. No matter what you sell, you can find an interesting angle that makes talking about your handmade products a breeze and also helps you sell more. You need to uncover you unique selling position (USP) and find a way to communicate it to shoppers in a natural and interesting way. If your USP isn’t as clear or you’d just like to explore some new ways to pitch your products and increase sales, download either or both my ebooks. MAKE MORE MONEY AT CRAFT FAIRS will walk you through the basics and turn you into a confident vendor; even if you currently feel uncomfortable standing behind that table and aren’t quite sure what to say beyond “Hi”. It goes into uncovering your USP and what shoppers want to hear and how you can become more relaxed when selling…I might even go so far as to say you can find a way to enjoy selling. It also walks you through the exact steps to craft a perfect sales pitch. THE SUCCESSFUL INTROVERT walks you through ways to let your display do the selling for you so you’re required to speak less. But sitting silently is never recommended so I also walk you through 6 steps to really get comfortable and confident, and how to involve the customer so it takes pressure off you to do all the talking and say the right things. I also share a few ideas on how you can draw the attention away from you as you talk in case you really don’t like being in the spotlight…even if it’s just a one-on-one conversation. THE SUCCESSFUL INTROVERT also shares my favorite exercise I use when preparing my sales pitches and pages. To me, it’s the perfect example of what not to do when talking about selling features. As someone who drives a car and regularly fills it up with fuel, listening to the 7 ingredients found in their fuel does nothing for me. I don’t know how my car benefits from anti adhesion compound or marker molecules. Those are big fancy words people in their industry might understand but they go right over my head. They’re promoting better gas mileage so I personally think they would have been better off explaining 7 things I could buy or do each month with the money I’ll save on gas. The exercise mentioned helps you avoid this type of sales pitch. Okay, I’ve just explained what makes a booth, vendor or business the most popular one at a craft show. Now you’ve got to apply each of the points to your business. There is no magic product when it comes to being successful at craft show: anyone can do it and any product can be the most popular. A strong identity across the board (products, display and you) will get you further than following a popular product trend. 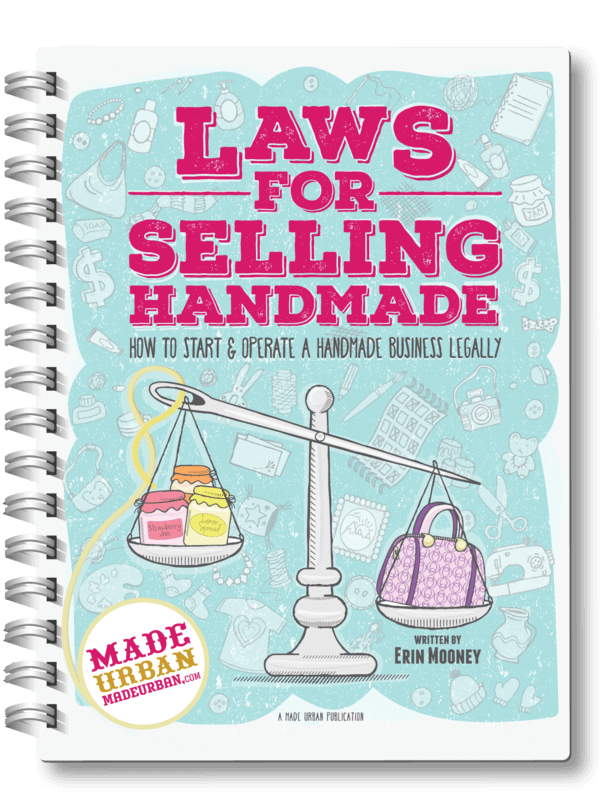 Start refining your handmade products and follow the advice, examples and worksheets in the the FREE sample chapter from my ebook. It’ll walk you through each area mentioned above and more. Grab your instant download here. This FREE 5 day challenge has been insanely popular (not bragging, just really excited it’s resonated with so many people;). Sign up for that and you’ll receive 5 emails over 5 days with clear directions on how to incorporate the 5 essential elements and pull your display together based on your products, message, brand, story as well as tricks to make your craft show display stand out. Think about the way you look and talk when selling at a craft show. Does it appeal to the type of customer you want to attract? Consider any changes you might need to make. Take a good look at your sales tactics too. If you’re uncomfortable when it comes to selling, your shoppers will feel uncomfortable too. If you feel as though your selling techniques could use a little polishing, you’d like to find more comfort in selling or you don’t even know what to say when someone’s browsing your table, I do have more information for you. Both MAKE MORE MONEY AT CRAFT FAIRS and THE SUCCESSFUL INTROVERT have a chapter on selling and cover different techniques. They include steps to find your selling style and include worksheets so you can uncover your perfect sales pitch. And if you’re interested in both, take advantage of this link and receive 20% OFF when you buy them together. Join the FREE “5 Days to a Standout Display” challenge. You’ll have email access to me so you can ask any questions you like! And download MAKE MORE MONEYS AT CRAFT FAIRS & THE SUCCESSFUL INTROVERT for more in depth information, examples and worksheets. Leave a comment below if you enjoyed this article or have any questions or comments. Thank you for the info. I really enjoy all of your ideas. One thing also to remember is don’t wear strong perfume or cologne. I know people who walk by the booths offering scented items due to allergies. Why turn away business from sensitive people when you aren’t even selling those items. I used to love a store & the woman who managed it was so nice but I hated her perfume and she doused it on. I ended up having to avoid shopping there. That’s a great point Diane. Thanks for reading and sharing your tip!! Diane, we are just starting out, and these are excellent ideas for us. By branding will a signature do? We both work in wood.. So I have the retail & craft show experience. But this was point on. Such great points and I love how you wrapped it up at the end recapping all the points you nailed. I also feel I could rewrite entire commercials lol. I just realized I’d already commented on this (the hint about perfume/cologne as a salesperson) but it was so worth the reread I had to again! Branding is about more than just a logo or signature. Your signature can make a great logo. Do consider that typefaces and fonts can’t always be copyrighted. Which means, if you create a logo using a particular typeface, another business may be able to use the exact same typeface, resulting in s similar styled logo, which may cause brand confusion. Im new on the craft selling market .I enjoyed your tips and advice and im taking on board your helpfull prose and cons with me on my first craft fare. Very informative and spot on, thank you. Thanks for the tips. We just started selling sand art bottles at shows. I remember several vendors at every show when I was growing up, now it’s just us. We have been the only sand art vendor at our last 7 shows. One thing we learned from our supplier, coloredsand.com, that was true, display your stuff at eye level for your customers. Our are kids so we made really low tables that they could see and work at. That made a 30% increase in our sales from the 1st 2 shows we did with higher tables. Thank you Denise, Adrienn and Jason! Hope you had a great first event Denise! Jason, that’s a really smart idea! Multi levels to appeal to the customers who use your product and the ones that buy. Wow, this is jam packed with fantastic ideas! Thanks for pulling it all together in one spot. I’m new to the Art Festival world and this has been a great introduction. I especially agree with the Branding bit as Marketing is my background and I’ve learned that everyone likes a duplicatable story. Thank you for the great ideas and details! This is the best article I’ve seen on the craft show topic. Speaking of Seinfeld, I like to use “Levels” (remember Kramer remodeling his apt,?) I set up sturdy cardboard boxes in different sizes and heights on my table. Then I cover them with the same or complimentary fabric as the fabric I’m using to cover the flat table surface. (Different patterns may be attractive but you don’t want your table to look too “busy” and distract customers from your actual crafts.) I’ve received positive comments about my display because of the use of different levels. Love your stuff. Always good info. I think I have all of your books. Very informative and helpful. If you liked this article then you Will want to check out others. All are excellent.